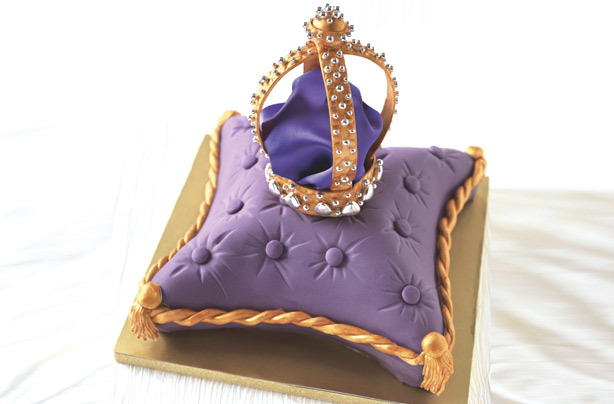 Originally designed to celebrate the Queen’s Diamond Jubilee, this cake would also be perfect for a little Princesses’ party. Note: We made up royal icing from a packet of royal icing sugar. Just reduce the quantities on the packet to only make up a small amount. Position an oven shelf just below the centre of the oven, so that the cake will sit in it centrally. Set the oven to 160°C/310°F/Gas Mark 3. Tip all the cake ingredients into a bowl and beat well until smooth. Spoon the mixture into the lined tin and level the surface, then hollow the centre slightly. Place the cake tin in the oven, then cover it with the baking sheet, buttered-side down, so the cake won’t stick to the sheet once it rises. Bake the cake for 2 hours, then remove the baking sheet and continue to cook it for 15-30 minutes, or until a skewer comes out clean after being inserted into the cake. Remove the cake from the oven and leave it to cool in the tin for about 30 minutes, then turn it out on to a wire rack to cool completely. To freeze: The cold cake may be wrapped in baking parchment and then foil, and frozen for up to 3 months. Allow it to defrost before filling and decorating. To make the buttercream: Sift the icing sugar into a bowl and add the butter, salt and vanilla. Add 1-2 tablespoons boiling water and beat until the icing is smooth and soft. Keep a sheet of cling film pressed against the surface of the icing if it’s not being used immediately, so that it doesn’t crust over. If it gets too stiff, it may need to be beaten again.